Even though Browse Pax promises to enhance your browsing experience by providing tools for searching the web and finding the best prices, you should still delete it from the system straightaway if it happens that you detect it on your computer. The program does not look harmful at first sight; however, you should still not keep it because it is nothing more than just an advertising-supported application. Luckily, the program can be eliminated via Control Panel; however, if you still do not know how to do that, you should definitely read through this article. 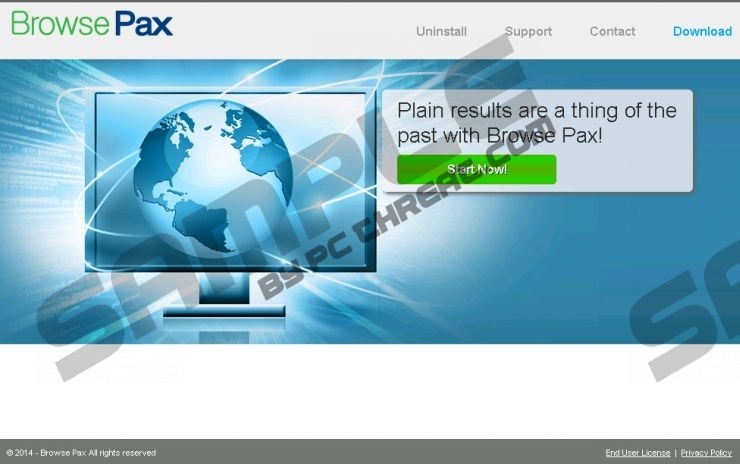 The security experts at pcthreat.com recommend that you eliminate Browse Pax as soon as possible because this program is more harmful than beneficial. Actually, it will not do anything good for you, so there is no point in keeping this program on the system. According to our specialists, Browse Pax might even expose you to threats because ads that it generates can lead you to unreliable websites. The program can also access information about the websites you visit. It can even record your search queries. If you do not like this idea at all, you should delete Browse Pax from the system as soon as possible. It is the only way to stop all those suspicious activities. Unfortunately, there are hundreds of adware programs published by Super Web LLC, which means that they might enter your system in the future. In order to protect your computer from threats, you should install an antimalware tool on the system. A reliable security application will prevent malicious software from entering your system; however, you should still be very cautious. Our security experts recommend that you always check whether the program which you are going to install is reliable. In addition, it is worth paying more attention to the installation process. It is very important that you delete Browse Pax from the system because this program is definitely not the most reliable one. Scroll down in order to find the instructions that will help you to erase this adware program manually. If you are a less experienced computer user, you can delete this unwanted program automatically as well. You just have to scan the system with an antimalware tool. If you are interested in our opinion, we believe that SpyHunter is one of the best scanners because it will not only detect different kinds of infections, but also protect your PC from future threats. Quick & tested solution for Browse Pax removal.